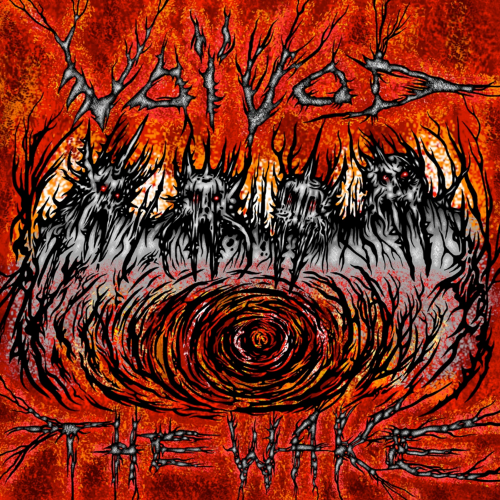 14 albums in, Voivod still sound like no other metal band. Nobody writes riffs like Voivod. Their riffs are like lemons (bear with me) – they’re so dissonantly sour that they make you want to scrunch up every muscle in your face, and whilst some people may hate this sensation, for others (strange folk like myself) it’s the entire appeal. Even after the death of their guitarist Piggy, the Canadian prog thrash weirdoes continued to deliver the same positively fucked-up guitar sound on their last album Target Earth (which happens to be the first album I ever reviewed on this blog). My review of it was criminally short and doesn’t really get across how much I enjoyed that album. It was one gloriously twisted riff after another and the frantic percussion was equally satisfying. My only gripe was that it didn’t really explore any new territory for the band. The Wake meanwhile explores lots of new territory - especially in its latter half. Opener ‘Obsolete Beings’ commences with eerier rotor-blade-like whirring and then dives into a fairly conventional (by Voivod standards) thrash riff. It allows the listener to ease their way in before entering the tumult that follows on ‘The End of Dormancy’ – from here on in the pace changes multiple times per track as the band throw you from one riff to the next. Fourth track ‘Iconspiracy’ is a particular highlight, opening with spidery chugging before plummeting into what may be the first blast beat I’ve heard on a Voivod album. As mentioned earlier, it’s the second half of the album where the band really get into their sonic adventuring. The band start to play with epic string sections and the transitions per song seems to increase. ‘Always Moving’ is bustling with creative ideas from its off-kilter thrash riff to its zero-gravity verse made up woozy chromatics, and features a brief but gorgeous guitar solo towards the end. Closing twelve minute track ‘Sonic Mycelium’ meanwhile ends up being a mash-up of every track that preceded it, building up to a climax of strings before dissipating back into dissonance (they could have ended it melodically, but that wouldn’t be very Voivod-esque would it). Belanger’s snarling vocals seem slightly weaker on The Wake and at times they take on an irritating nasal quality that reminds me of Dave Mustaine (yeah, I’m not a fan of Mustaine’s voice). The sci-fi lyricism and Belanger’s willingness to break into comical na-na-na-ing stops me from taking them too seriously, but considering that every other instrument is perfectly orchestrated, it’s difficult to ignore. Given that the band are all aging, I think it's something I'll just have to accept - you can replace worn guitar strings, but worn vocal cords aren't so easy to fix.